Nine 1,000-yard rushers, seven NFL backs, and a finish among the nation’s top-six in rushing over each of the past six seasons. That pretty much summarizes Oregon football’s ground attack since 1999, making it arguably the most prestigious factory of running backs over the past 15 seasons or so. Over the years, numerous schools have made a case to be the true “Running Back U,” and, perhaps at some point in history, each was justified in their claim. In the early 2000s, Miami played host to Clinton Portis, Frank Gore, and Willis McGahee. Texas can boast the production of Earl Campbell, Ricky Williams, and Jamaal Charles, while Syracuse had the astounding run of Jim Brown, Ernie Davis, and Floyd Little. Plus, how could we forget about Oregon’s own conference rival in USC (known to many as “Tailback U”), represented by O.J. Simpson, Marcus Allen, and Charles White — the Pac’s all-time rushing leader. 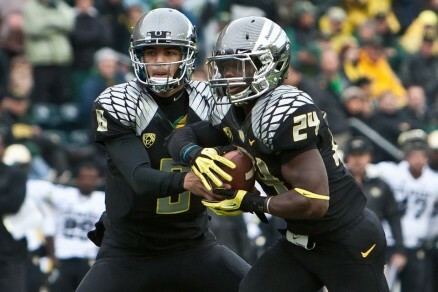 Kenjon Barner rushed for over 1,700 yards in 2012, marking the sixth straight season the Ducks’ had a 1,000-yard rusher. With all that being said, very few teams across the nation have matched Oregon’s production of stellar backs over the past 15 years. Perhaps the only other school that has come close to this kind of consistency in recent history is Alabama. When comparing the two schools, they appear to be quite similar, at least in terms of the numbers. As was previously mentioned, Oregon has hosted nine 1,000-yard rushers and produced seven NFL-caliber backs since 1999. In that same time frame, the Crimson Tide boasted seven 1,000-yard rushers (including two in the same season in 2012) and six NFL backs, numbers nearly identical to Oregon. Now, while these numbers may give a good idea of which school is the real “Running Back U,” they are, of course, not the only factor to be considered. 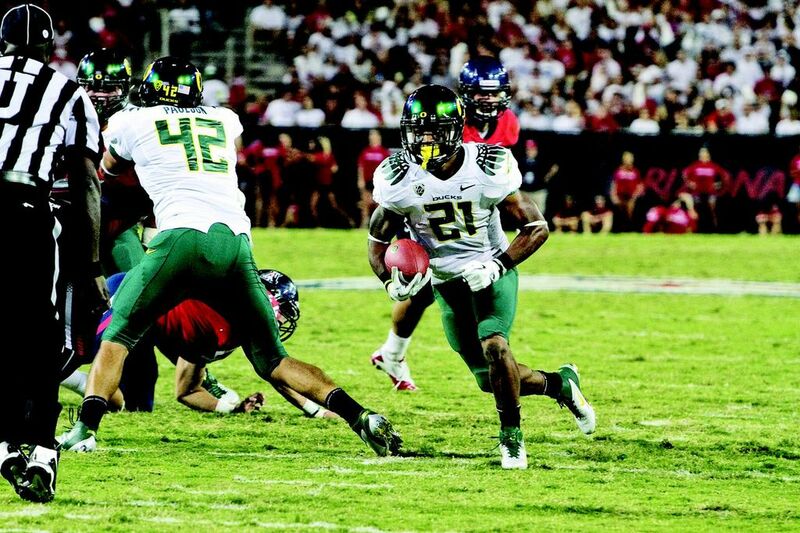 Oregon runs a spread out, hurry-up attack that forces defenses to put bodies on the outside. This opens up a lot of running room in the middle of the field for the Ducks’ backs. Many would use this to argue that the success of Oregon’s backs is due more to the system than their talent. However, the Ducks have not necessarily run Chip Kelly’s brand of offense throughout the last 15 years. In fact, Reuben Droughns, Maurice Morris, and Onterrio Smith received plenty of looks in pro-style formations during their time in Eugene. Plus, in terms of NFL success, Oregon’s runners still appear to have the edge on the Crimson Tide in a number of categories. Of Alabama’s seven professional backs that started their careers since 1999, only Shaun Alexander has had a career lasting for more than four seasons. 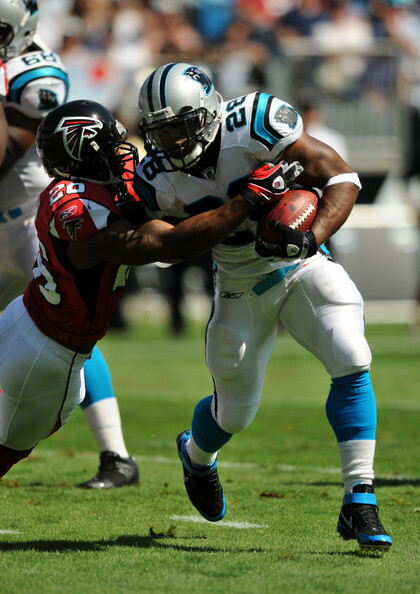 Shaud Williams, Kenneth Darby, and Glen Coffee each left the league early into their pro tenures. Certainly it must be considered that Eddie Lacy, Mark Ingram, and Trent Richardson have all, at the most, played two full seasons. Still, out of Oregon, Droughns, Morris, and Jonathan Stewart have all eclipsed the four-year mark for their career while LeGarrette Blount is currently heading into his fourth season. On top of that, three Oregon backs have recorded 1,000-yard seasons in the NFL (Droughns, Stewart, and Blount) while Shaun Alexander is the only Bama back to do so in that same time frame (though he did do it five times). Others may argue that the strength of opponent must also be considered when identifying the nation’s most prestigious running back factory. The common claim would likely be that the Crimson Tide’s strength of schedule is much tougher than that of Oregon. In recent years, that is certainly a reasonable claim given the strength of the SEC. But Alabama also boasts one of the strongest offensive lines in college football history. Even in the first round of last month’s NFL draft alone, two Tide linemen were selected to go pro. This is not to take away from Oregon’s strong front wall or the Tide’s running game. It is only to point out that Alabama’s elite line should at least be factored in to the argument concerning strength of opponents. There are plenty of other college football programs that could contend with these two powerhouses. I do not mean to exclude the Texases, USCs, and Miamis, of the world. It does seem, however, as though Bama and Oregon, with their two opposite styles of play, have set themselves apart from the pack in this race. Alabama’s Mark Ingram, Trent Richardson, Eddie Lacy, and T.J. Yeldon marks one of the best backfield runs in recent history, a run that can only be matched by the likes of Jonathan Stewart, LeGarrette Blount, LaMichael James, Kenjon Barner, De’Anthony Thomas, and soon to be Thomas Tyner. 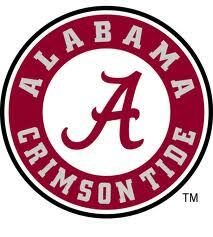 Given the recent success of both the Tide and the Ducks, it is not unreasonable to think that we could soon see them play for the national title. For now, I’ll give the edge to the Ducks, but it may not be until that title game that the college football world knows for sure.